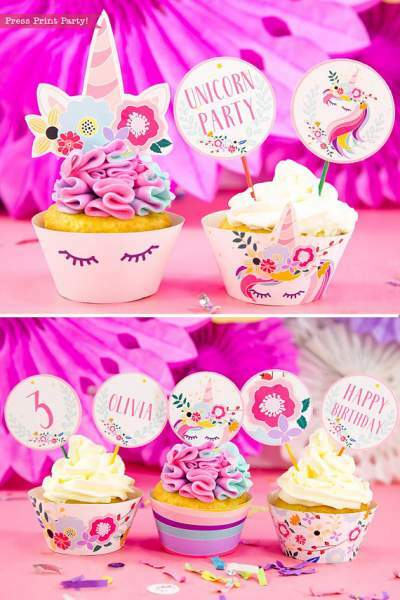 Truly Magical Unicorn Birthday Party Decorations (DIY) - Press Print Party! Princesses, mermaids, and unicorns. 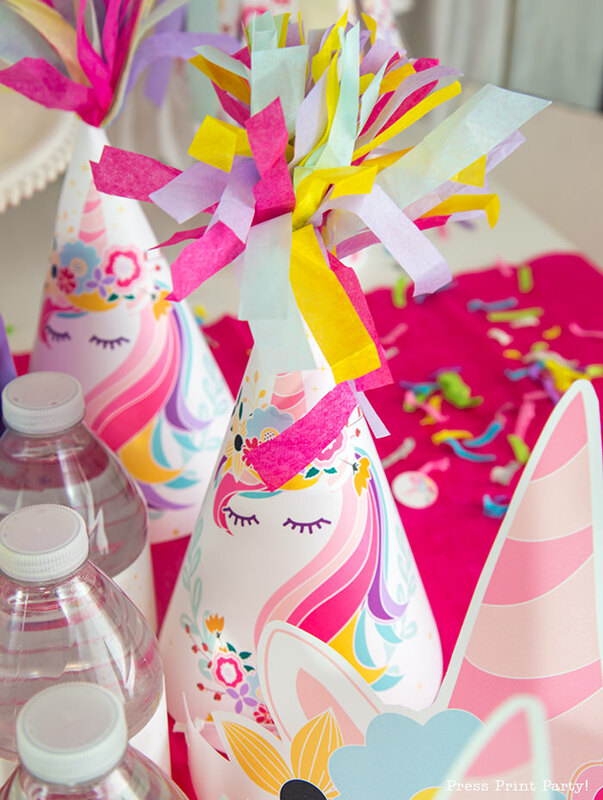 Every little girl will ask for at least one of these party themes before they’re 10. Maybe even all 3! 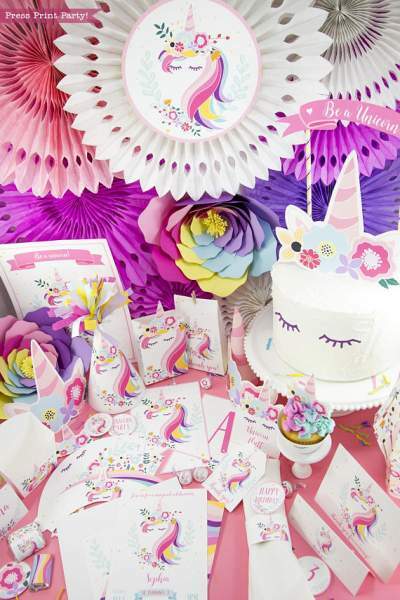 Well, if a unicorn party is the choice this year you’re in luck. 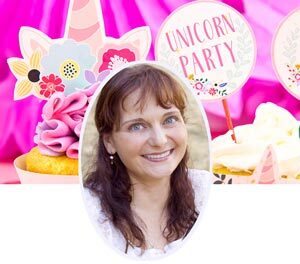 Because I can show you how to create a truly magical unicorn birthday party as easy as pie and totally doable at home! 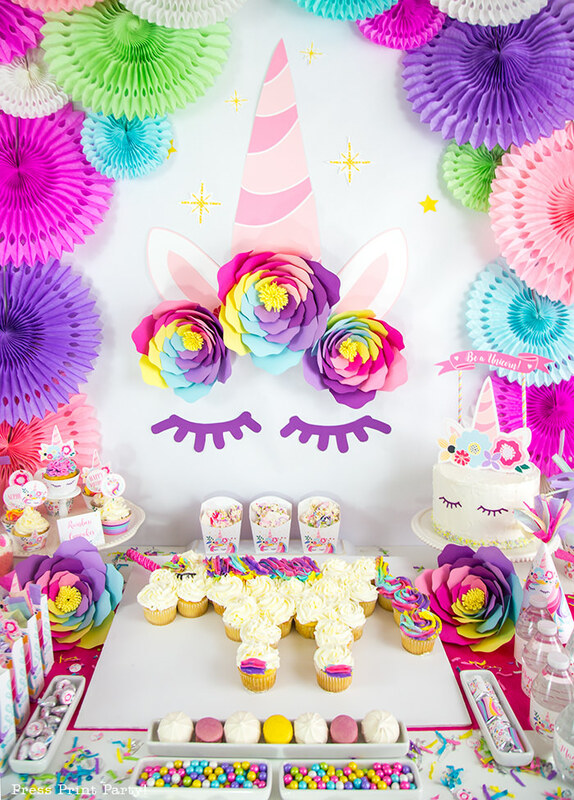 I had so much fun creating this unicorn party! Everything is so bright and “unicorny” as my daughter would say. 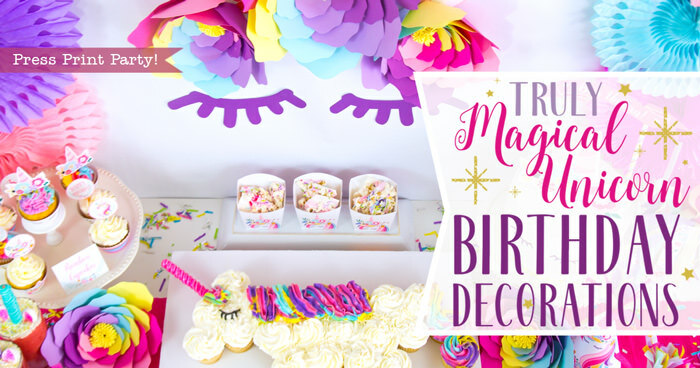 This post will launch a series of posts in the coming weeks with everything you need to recreate this party! 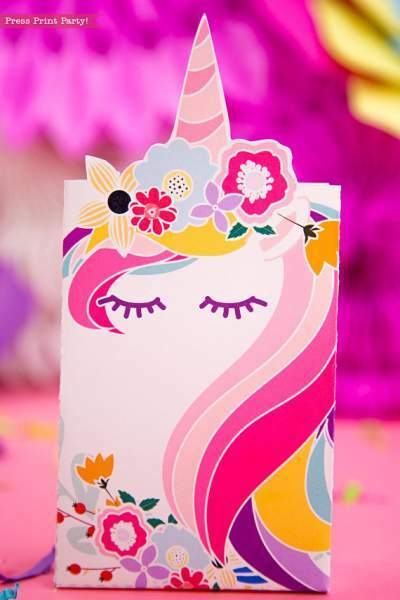 I started with the colors from the hair on my unicorn printables. Pink and Purple being the dominant colors with a little bit of blue, green and yellow mixed in. Not quite a full rainbow unicorn but so much more girly. 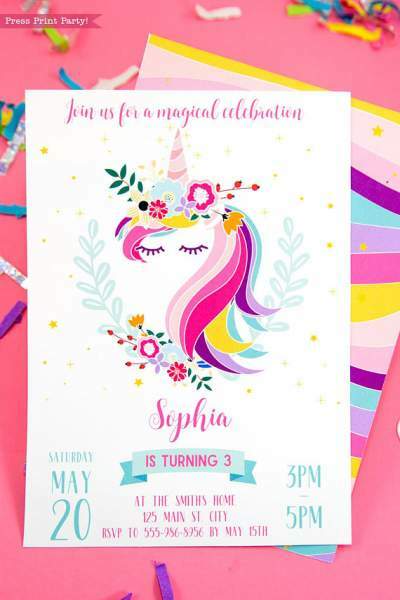 If you’re looking for a complete set of unicorn party supplies and don’t want to set foot in a store, this is the set for you! 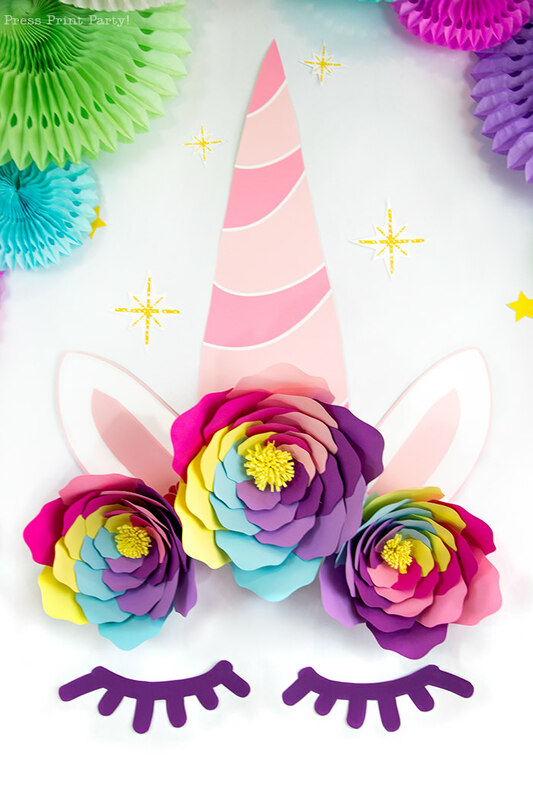 To make a bold statement on the wall, I bought some matching paper fans in unicorn colors and fanned them around the large printable unicorn horn from my collection. Complete with ears, sleepy eyes and stars, just print, cut, and use some glue dots to place them on the wall. 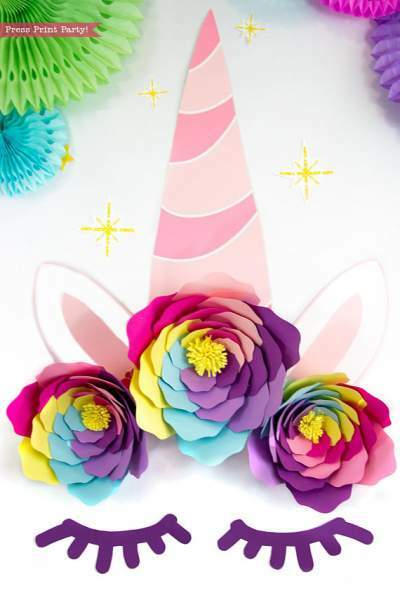 The amazing flowers were adapted from the unicorn paper flowers from Abbi Kirsten Collections. I used her fantastic template but only used 6 colors. I’ll go into detail about how I made the flowers in a later post. I made a table skirt out of tulle and ribbons (more details coming in a later post) and made fun multicolored tassels with tissue paper. 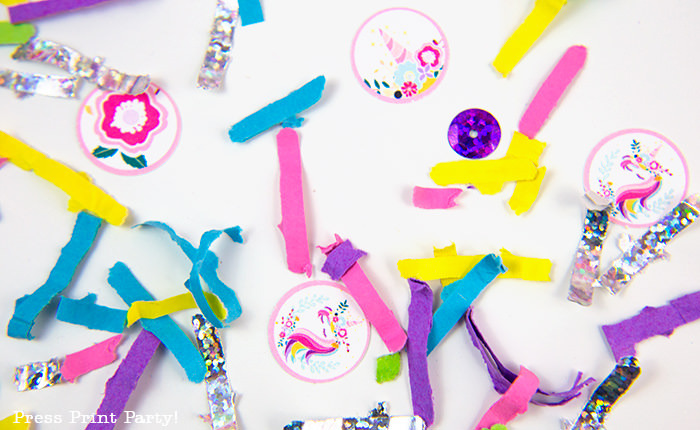 I have a paper tassels DIY post but will make sure to add another post showing you how to make them multicolored. 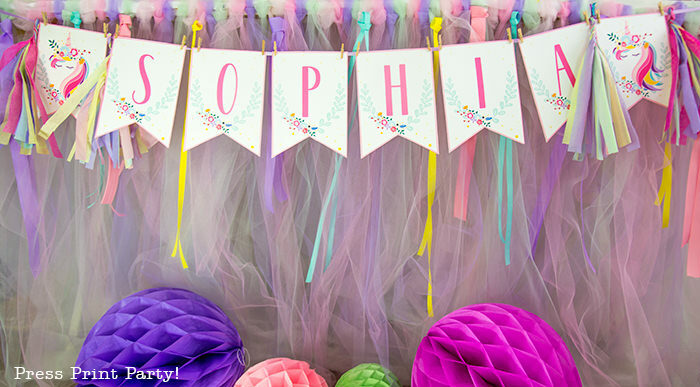 I added tassels to the custom banner and to the tops of the party hats to make them even more festive! 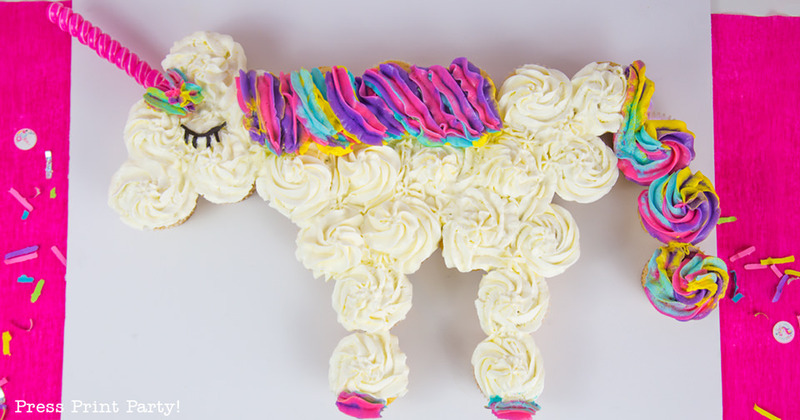 There are a lot of options out there for unicorn treats. 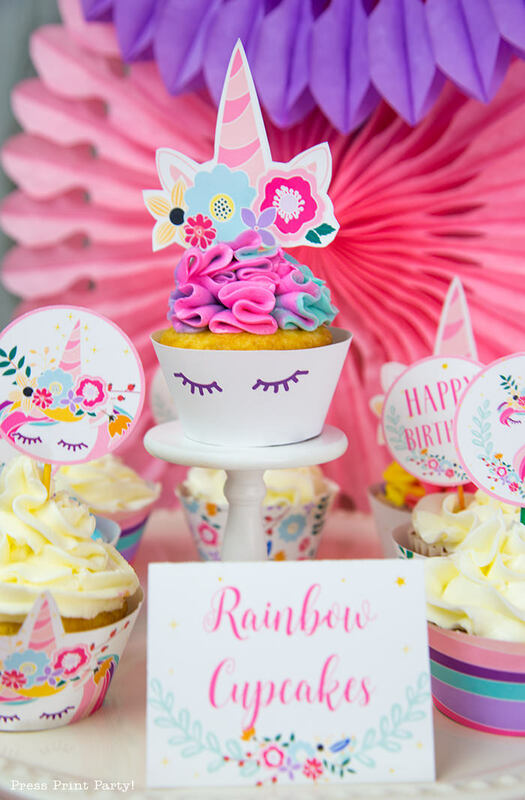 I went a little overboard with the cakes here but I wanted to show you 3 very easy DIY options that won’t leave you pulling your hair out. 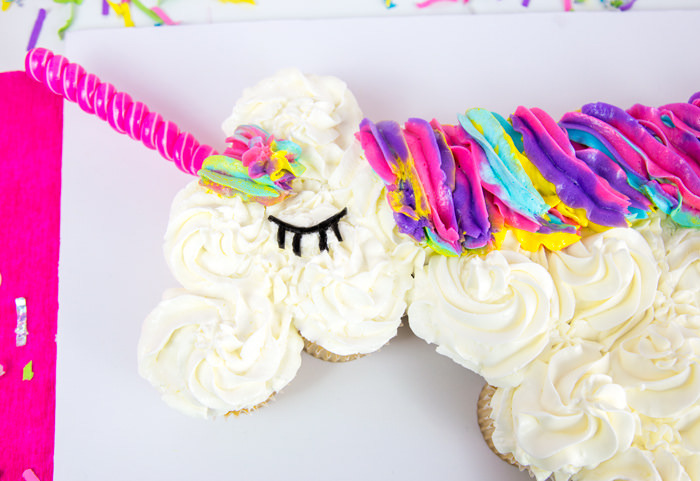 A unicorn cupcake cake is the perfect DIY option. 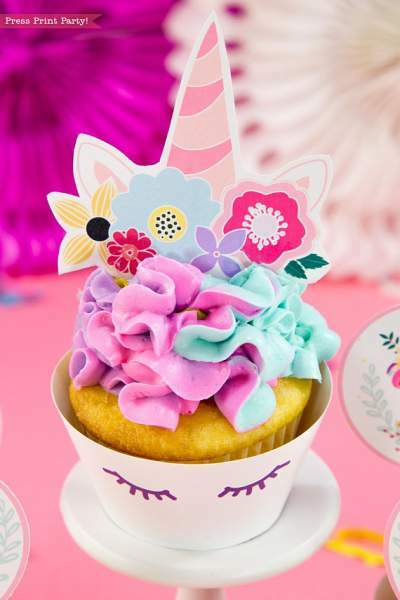 It has the wow effect, it’s easy to make, and it does not require a lot of piping skill. (I can pipe a swirl but not a whole lot else and I was able to make it). Of course the multicolored swirl frosting was a little bit time consuming but not too hard to master. I even made a video tutorial for you. 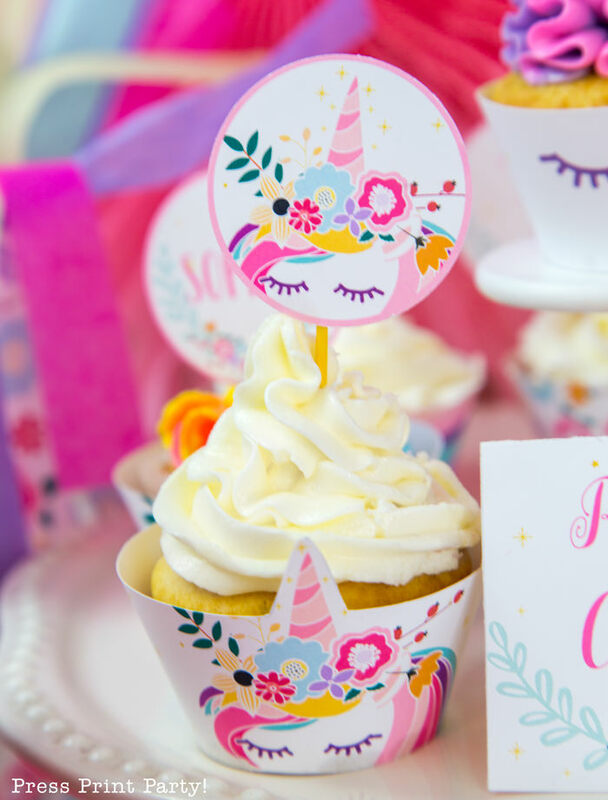 You can also add extra cupcakes on the side with cute little wrappers and toppers available in my unicorn set of course. 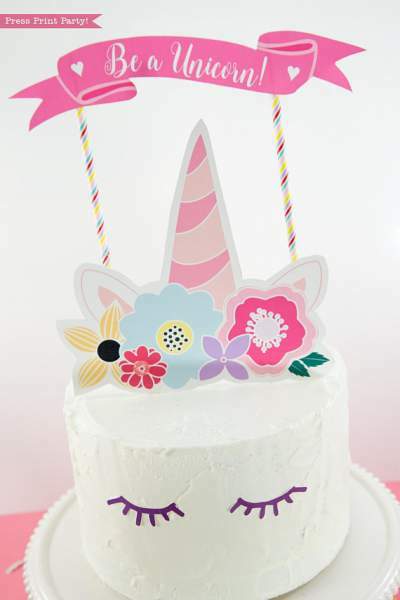 If pipping is just not for you, or you insist on a regular cake, you could just grab a white cake from the store and add the printables toppers from my unicorn collection to transform it into a pretty unicorn cake. So EASY! 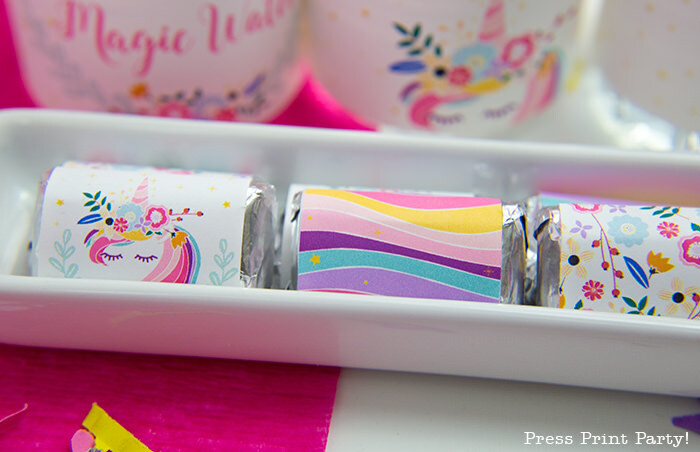 I also made some unicorn bark at my daughter’s request. It ended up being really simple and delicious. 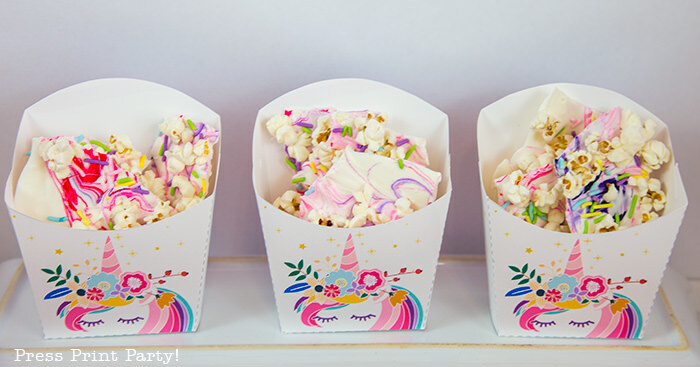 It’s just white candy melts with some food coloring, popcorn and sprinkles. The only healthy treat was the delicious unicorn smoothie. I adapted a trick from “What’s up moms”‘s unicorn smoothie to make the swirl in the glass. It’s just blueberry yogurt that I swirled and froze before adding the strawberry smoothie. (Yes, I’ll write a separate post on that too). 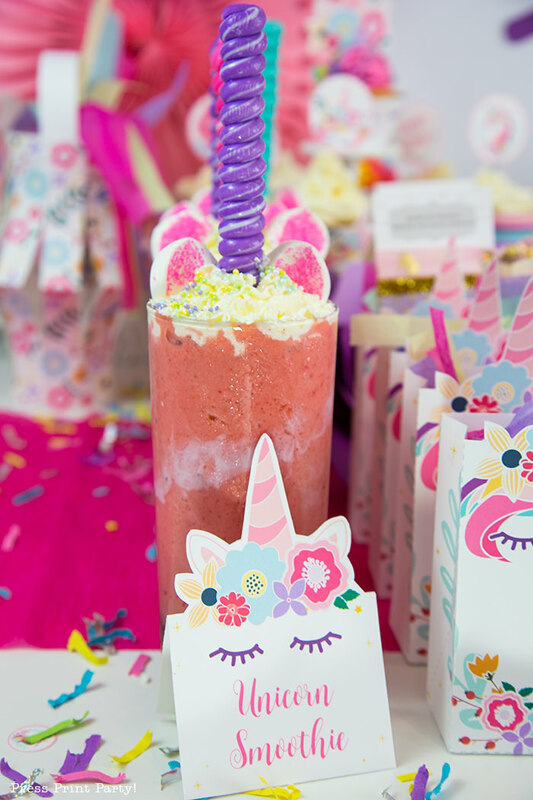 With a lollipop horn, marshmallow ears, and some sprinkles this delicious smoothie was surprisingly easy to make. Of course it’s always a requirement to have some chocolate available for that inevitable craving. 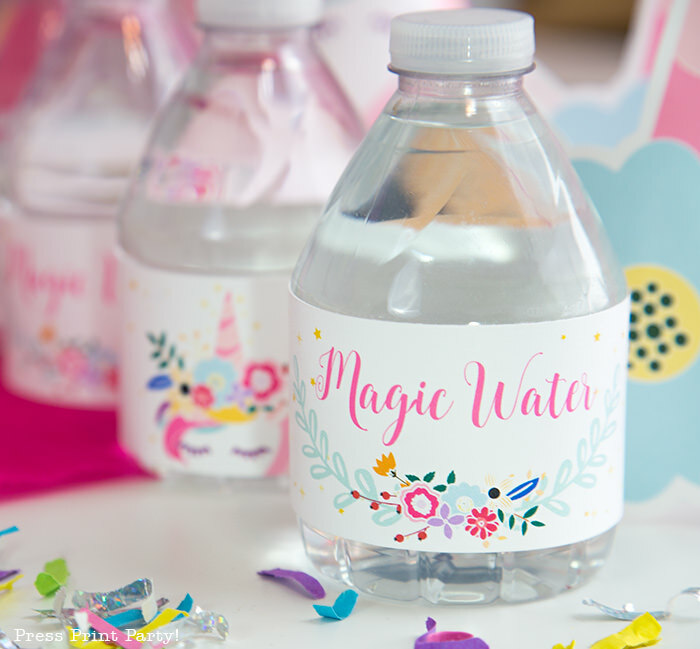 Labeling regular water “Magic Water” somehow makes it more appealing too, don’t you think? 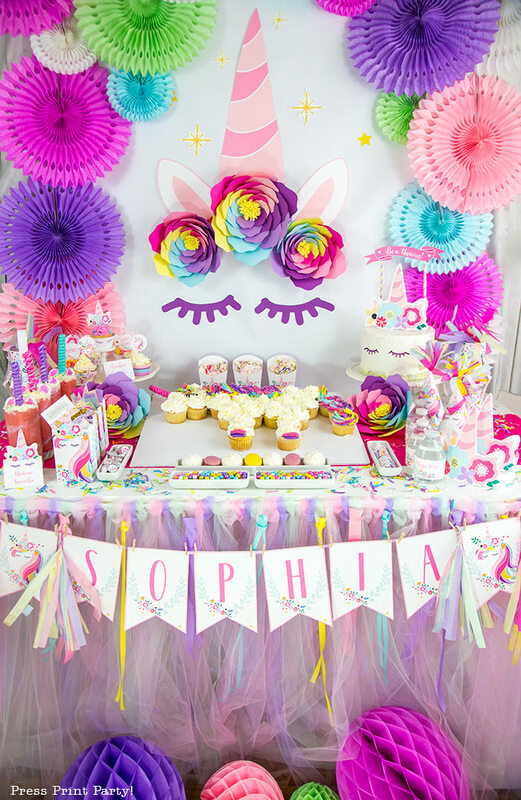 Matching unicorn confettis from Festivefetti with some punched confettis from my unicorn set, quickly cheered up the whole table. 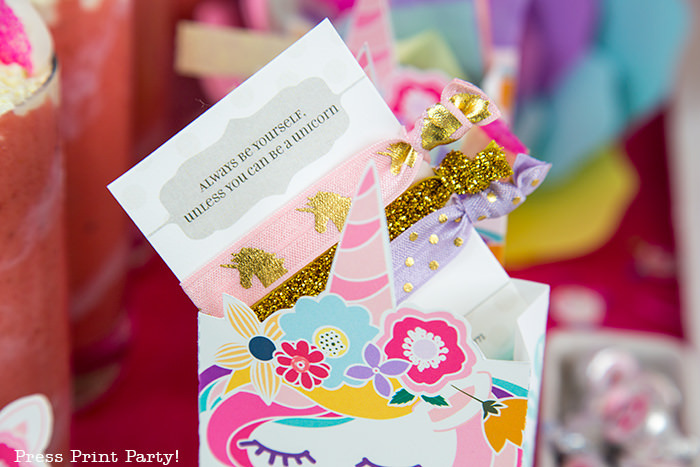 The girls really enjoyed these unicorn hair ties from Plum Polka Dots as their party favors. 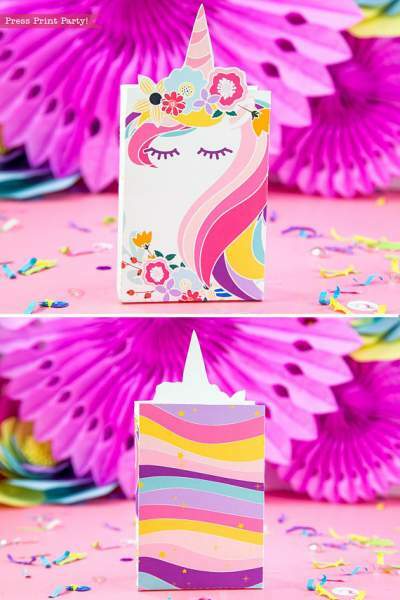 AND they fit perfectly in this little unicorn favor box. 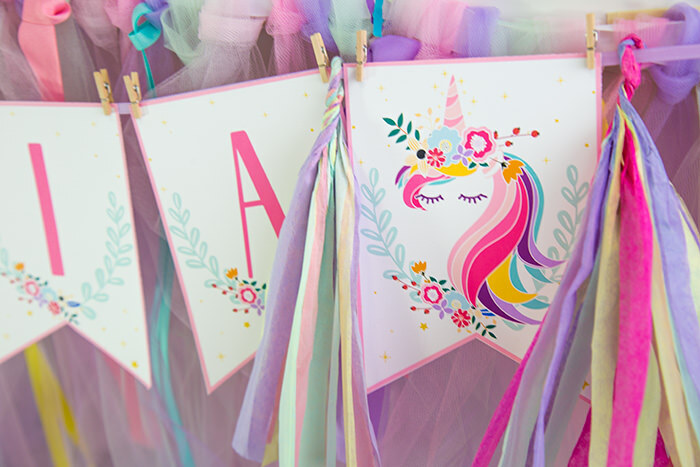 All in all, a super cheery DIY unicorn party that will have little girls squealing in delight! 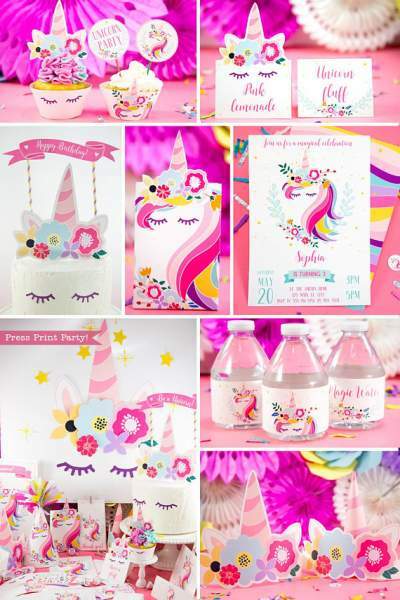 Unicorn Printables from Press Print Party! Can you get just the name banner? Answered by email. Thank you! Hi! 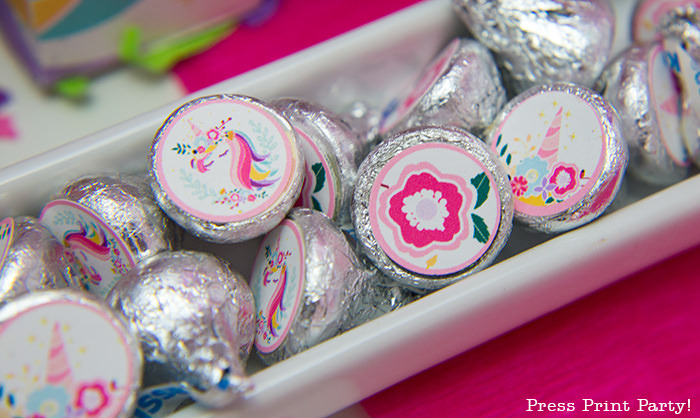 Can someone get just the mini chocolate wrappers and kisses label printables? Thanks Mandy, I hope you enjoyed your printables! You went all out on this one. It’s fantastic! 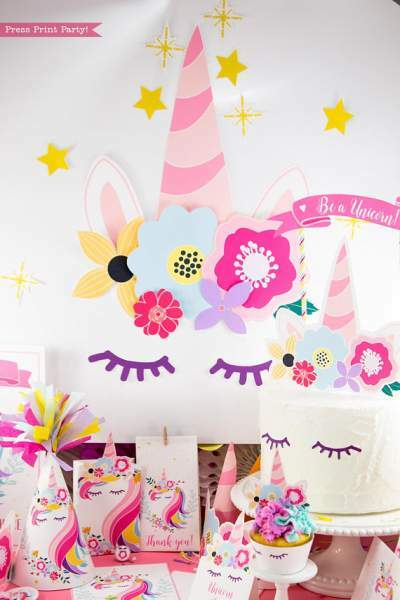 Love love love this printable set The design is wonderful and all the little details are so fun. Oh wow! Amazing details and the paper flowers are absolutely beautiful!! Thank you so much! 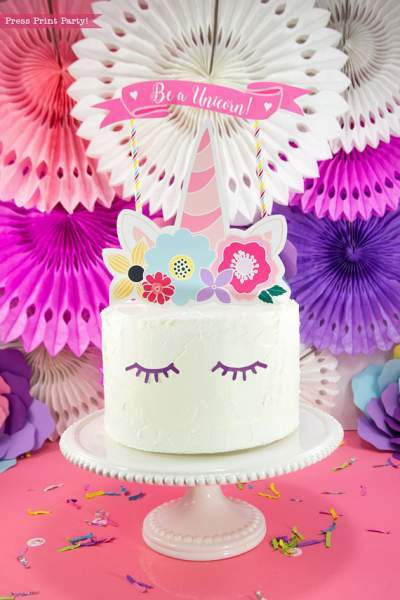 I love those paper flower templates! Such a magical party!! 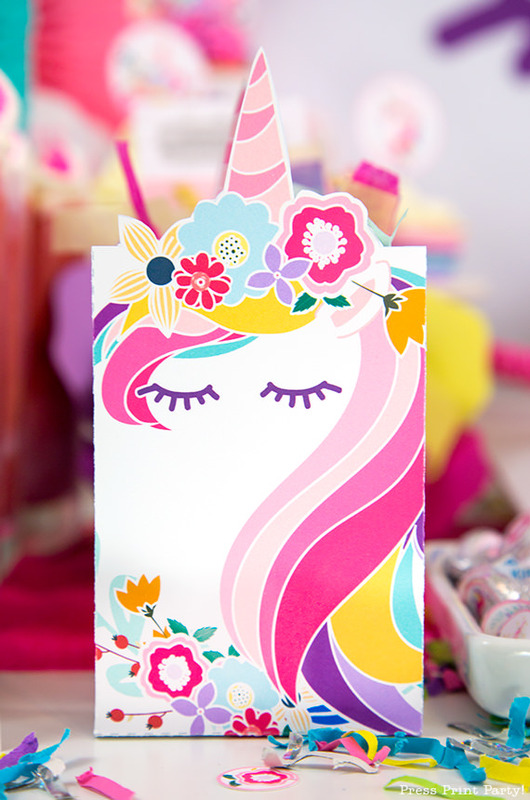 Those printables are all so darling!! It took me a while to get this party out but I’m sure super happy with the results! Your flowers always cheer up any party! 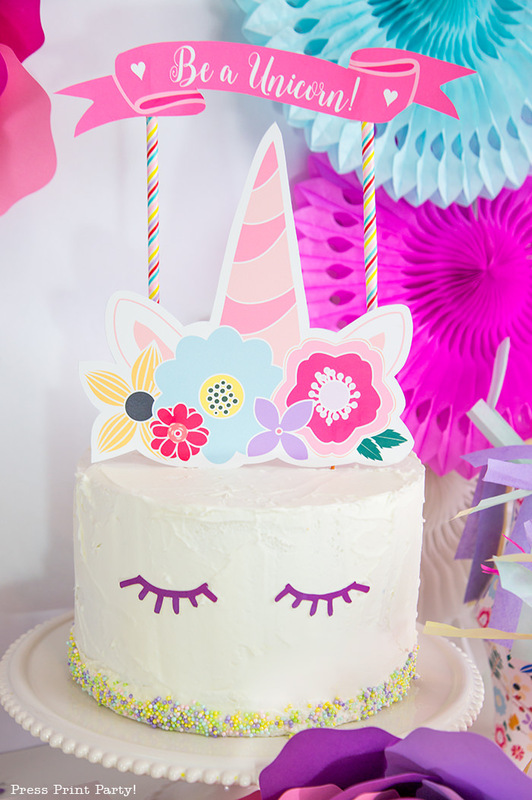 When I saw your multicolored unicorn flowers I knew I had to use them! !